Samsung Electronics today announced Samsung Pay will add three new countries to the roadmap including Malaysia, Russia and Thailand, which will bring the convenience of the service to 10 countries by the end of 2016. Samsung Pay also announced a global partnership with Mastercard to offer a simplified online payment and express checkout solution through its digital payment service Masterpass, starting early next year. Hundreds of thousands of merchants in 33 countries currently accept Masterpass for online payments. Express Checkout: Skip the process of filling out long online forms. With the express checkout solution, customers will be able use their Mastercard debit or credit cards along with the shipping information saved on their Samsung Pay account to quickly complete online transactions. Make Purchases from Any Device: Customers can make online purchases from a computer, tablet or smartphone while shopping on their favorite sites or apps. Secure Transactions: Security remains our top priority. When making online payments, a unique token is used in an encrypted form – not the actual debit or credit card number. Users can authenticate transactions using secure methods including a fingerprint scanner, which is built into Samsung’s mobile devices. Samsung Pay also announced new features in the United States, including support for in-app payments and new nearby discounts and savings, marking one more step toward a true digital wallet. The announcements came at Money 20/20, a leading payments and financial services event. Beginning in November, Samsung Pay users will be able to locate discounts and coupons for nearby stores and restaurants through the new Deals feature within the Samsung Pay app, and redeem these deals instantly. With a new refreshed look, and enhancements to user experience and design on the Samsung Pay app, users will be able to find and redeem instant savings easily and quickly. 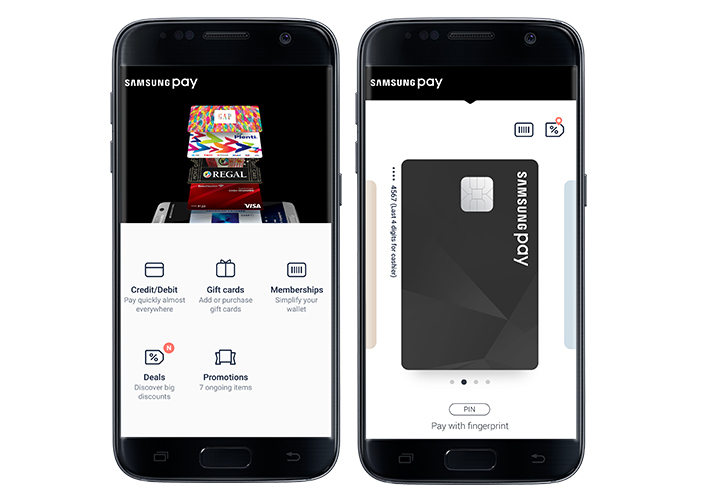 In November, users will also be able to use Samsung Pay as their payment option when they shop at select merchant apps. Simply select Samsung Pay during check-out, and select from the cards loaded within the app to make an in-app payment. To start, in-app payments will be available for Samsung Pay users when they shop with Velocity, Raise, Fancy, Hello Vino, Wish and Touch of Modern, with more to come. With the addition of its latest financial partners Capital One and USAA, Samsung Pay now supports over 500 banks and credit unions, representing over 85 percent of the U.S. debit card and credit card market. Samsung Pay, a mobile payment service from Samsung Electronics, is simple, safe and available almost anywhere* you can swipe or tap your card**. Combining NFC with Samsung’s proprietary MST technologies, Samsung Pay provides consumers a way to pay almost anywhere you can swipe or tap a card at millions of merchant locations. Samsung continues to strategically expand its partnership ecosystem for Samsung Pay to provide greater flexibility, access, and choice for customers while enabling an easy and safe payment experience. Samsung Pay is currently available in the United States on select Galaxy devices and wearables, including the Galaxy S7 and S7 edge, S6 edge+, Note5, the Gear S2, and the Gear S3 next month.